Thanks for downloading this revised and updated version of the podcast, which was first published on iTunes towards the end of 2012. This edition has been updated to tell a timeless story, to be enjoyed on any day, of any month, of any year. 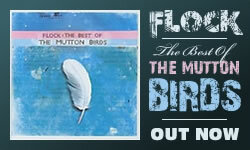 In Don McGlashan's own words then, this is the most complete story ever told in audio form of one of New Zealand's greatest musical talents: The Mutton Birds. "Anchor Me, it's a good one", one crazed pod-friend exclaimed upon hearing it (true story).